The economy experienced an unusually deep and prolonged contraction, especially in its labor markets. Employment and hours worked fell during 2008 and 2009 for many demographic groups, but disproportionately so among less skilled people, and among the unmarried. As of 2012, labor market activity still remained far below pre-recession levels. Over the same time frame, many facets of fiscal policy were changed, especially policies related to the distribution of safety net program benefits. Fiscal policymakers were of course watching the economy closely, and major safety net legislation was certainly a reaction to economic conditions. But unless behavior is completely unresponsive to tax and benefit formulas, we cannot have a full understanding of the relationship between fiscal policy and the economy without quantifying marginal tax rates, their changes over time, and their differences across demographic groups. The purpose of this paper is to help examine the labor market impacts of recent changes in safety net programs by measuring time series of implicit marginal labor income tax rates for the safety net as a whole and recognizing that marginal tax rates and their changes vary by demographic group. In this regard, the paper is a longitudinal version of prior studies appearing in Tax Policy and the Economy that showed how implicit marginal income tax rates vary with household income and other characteristics under a single year’s tax and benefit rules. Analysis of implicit marginal tax rates and their differences across groups might seem to be a specialized topic of poverty research, and only relevant for macroeconomic analysis to the extent that the economy is populated by poor people. However, this paper explains how people from the middle and above-middle parts of the skill distribution can become eligible overnight for safety net programs such as unemployment insurance and now SNAP (formerly known as food stamps) merely by becoming unemployed for a period of time. Thus, even skilled people have their incentives to seek and retain work determined in part by safety net program rules. 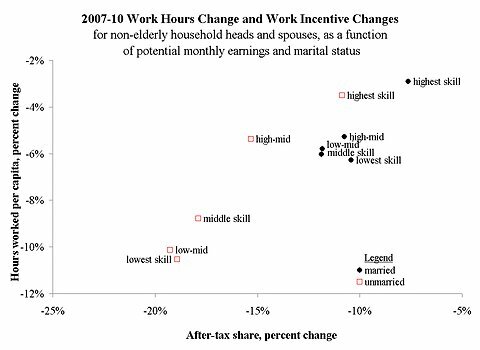 This paper shows that wide swaths of the skill distribution saw their marginal tax rates increase by more than five percentage points in less than two years. I consider the entire safety net, as well as payroll and income taxes, but give most of my attention to three programs spending the largest amounts on non-elderly households, and with significant legislative changes: unemployment insurance, SNAP (formerly known as food stamps), and Medicaid. I focus on the non-elderly population because the elderly have access to a different set of safety net programs and have a different (and weaker) relationship with the labor market. My marginal tax rate concept is a comparison of the total amount of subsidies net of taxes received if and when a person were not working to the total amount received (or paid) if and when the same person were working full time, expressed as a fraction of the amount produced when working full time. This measure is a marginal tax rate on the decision margin of working full time or not at all during a specific time interval. In this regard, my tax rate concept is reminiscent of the implicit tax rates used by Gruber and Wise (1999) and collaborators in their “tax force” measures of the retirement incentives created by public pension and disability programs around the world. The relationship between subsidies received when not working and the amount that could be earned when working full time varies by demographic group. A number of subsidies are set as specific dollar amounts (such as the SNAP maximum benefit, or the maximum unemployment insurance benefit), or as a specific bundle of services (as with Medicaid) regardless of how much the beneficiary might earn if he worked full time. Unemployment insurance benefits below the maximum are, on the other hand, specified as a proportion of the amounts earned in prior employment. Subsidies received by both employed and non-employed people also depend on the income of others in the household, and therefore can vary significantly by marital status. Finally, subsidy rules have changed over time as new legislation was passed, and calendar time triggered new provisions in old legislation. This paper therefore calculates marginal tax rates as a function of earnings potential, marital status, and calendar time. The paper begins with its conceptual framework for measuring work incentives implicit in the composite of programs known as the safety net, with emphasis on isolating groups-specific changes over time that come from changes in safety net program rules rather than changes in the behavior of the population served under a fixed set of rules. I then identify the changes in safety net eligibility and benefit rules that were significant for the non-elderly population. 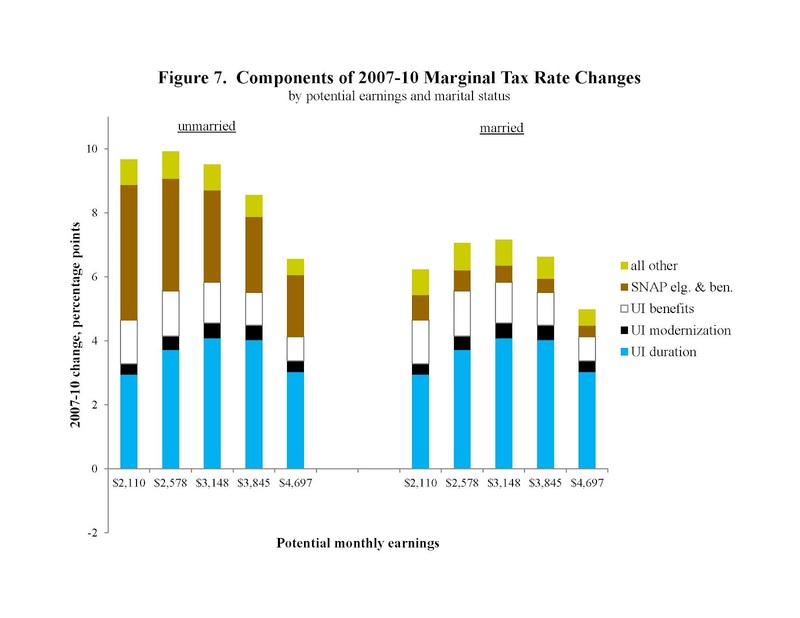 The paper concludes with marginal tax rate series that combine the program-by-program results of earlier sections and a first indication of how changes in these rates were correlated with labor market behavior. One point of view is that the labor market is slack during a recession, that as a consequence labor supply has nothing to do with labor market outcomes, and that household marginal tax rate calculations are of no help in understanding how people behave during recessions. 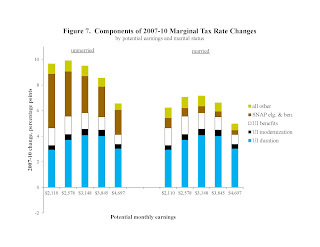 Even if this conception of slack markets were accurate, marginal tax rate changes are relevant because they tell us where the labor market is headed after it is no longer slack and supply incentives start to matter again. More important, both theory and evidence might support the opposite point of view: that subsidies for the unemployed and the poor matter as much or more during a period of significant labor market distortions, in part because those subsidies loom large relative to low offer wages. The conclusion of this paper also presents a puzzle for the theory that labor supply has recently been irrelevant: that 2007-10 changes in work hours per capita correlate so closely across demographic groups with statutory changes in the incentives to work. See Liebman (1998) and Kotlikoff and Rapson (2007). Because subsidy program participation is voluntary, a subsidy cannot have a large effect on incentives or behavior unless it redistributes a significant amount of resources. A tax program, on the other hand, can in principle create large marginal tax rates without redistributing much revenue. My tax rate is equivalent to a weighted average of (one minus) the local slopes of a worker’s budget constraint (in a graph of disposable income versus earnings from work), where the weights are the size of the income interval over which each local slope applies, because my tax rate is one minus the slope of the straight line connecting the no work point of the budget set to the full-time work point. In this regard, some might say that my tax rate measures “extensive margin” incentives, which are a weighted average of “intensive margin” incentives. However, readers should recognize that the concepts of intensive and extensive margins have a time dimension, which varies across studies and safety net programs. For example, the decision whether to work in the month of August is an extensive margin decision from the point of view of a program that monitors beneficiaries’ labor income on a monthly basis, but an intensive margin decision from the point of view of a program such as the Earned Income Tax Credit that monitors income on a calendar year basis (unless not working in all of the other eleven months of that year). 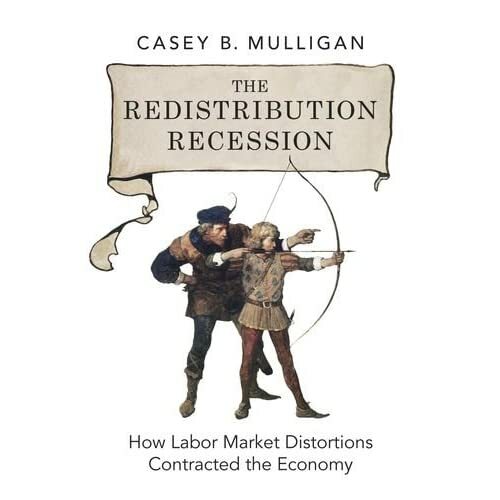 Mulligan (2012) reviews evidence on the cyclicality of labor market and production effects of marginal changes in labor supply and demand. 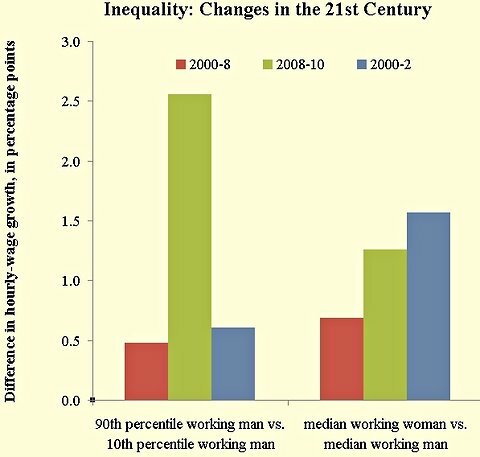 He finds that labor supply and labor demand shifts had essentially the same marginal effects on employment in 2008 and 2009 as they did in prior years. You can read the first chapter, and search the entire book, for free. When you're ready to read the entire book, it's only $30 including shipping! Get The Redistribution Recession extras on its www page. That the introduction of iPhone 5 increases consumer spending is no triumph for Keynesian economics, but merely an advertisement for plans by the Bureau of Economic Analysis to improve national accounting. Suppose there were an island economy with 100 able-bodied adults, all of whom work as fisherman, each catching a fish a day. The 100 fish are eaten by the island people, which makes inflation-adjusted daily consumer spending in the economy – or consumption, as economists call it – equal to 100. Now suppose that 10 of the fisherman decide to quit fishing to build, nurture and tend to an apple orchard. In the beginning, the orchard produces no apples, so consumer spending drops to 90 fish a day, because only 90 adults are out fishing while the other 10 are developing an orchard. Time passes, and a bountiful 100-apple harvest occurs. Because the apples taste good, the island fishermen obtain all 100 apples from 10 orchard owners in exchange for fish. The apple harvest has by itself boosted consumption in the economy, which suddenly jumped from 90 fish a day to 90 fish a day plus 100 apples. It would be ridiculous to proclaim that the apple harvest and its effect on consumer spending prove that the economy is plagued by a liquidity trap, or to insist that the immediate effect of the harvest on consumer spending is independent of the quality of the apples. By construction, this model economy has no Keynesian features, yet nonetheless a harvest has a large effect on measured consumption. Even if Keynesian economics were completely wrong, economists would expect the iPhone 5 release to cause consumer spending and gross domestic product to be greater than it was before the release, to a degree related to the phone’s overall value to consumers. Note that, as in my island economy, the development of Apple products reduces consumption before the release, because the people working on the coming products are not available to produce consumer goods during that time. Much of the development work on the iPhone 5 did not, before its release, count as investment or G.D.P. (G.D.P. is the sum of public and private consumption and public and private investment). The national accounts treat research and development activities as intermediate inputs, which means that they are subtracted from revenue for the purpose of determining a corporation’s contribution to national production. This same is true for, say, Apple’s legal expenses in developing patents (many of which are discussed on the Mactech Web site) and license terms for their new product. These development activities appear as G.D.P. only when the product is completed and sold. If the product is not valuable, it will not sell and will not count for much, although national consumption could still rise if upon project completion the developers move out of development and into the production of consumer goods. (Research and development employees usually receive wages during the development phase, but their prerelease compensation comes out of corporate profits). For the purposes of understanding the timing of economic activity, the national accounts’ treatment of research and development is a weakness, because it recognizes the developers’ activity at the wrong time – only after the product is released. Economists at the Bureau of Economic Analysis (the agency producing our nation’s accounts) are aware of this weakness, how it has become acute with the rise of the technology sector and steps they might take to improve the accounts. They are doing the best they can with the data and economic research results that are available. Measured consumption rises in the quarter when people buy their new iPhones, not when they actually use them (in my island model, the consumption would be measured when the apples are bought, not when they are eaten). IPhones are durable goods that are used for years after Apple sells them as new, including by second and third owners. Curiously, the timing of measured iPhone consumption would be markedly different if Apple or cellular carriers had chosen to rent the phones rather than sell them, because the measured consumption would occur each month when users paid their rental fees (the Bureau of Economic Analysis is aware of this weakness and rectifies it in sectors where it is most acute, like the housing sector). The iPhone 5 release is no occasion to cheer for wasteful government spending, but perhaps does help make the case for a larger budget at the Bureau of Economic Analysis, so that it can continue its progress on measuring the amount and timing of economic activity. A bunch of posts dated from June, July, and August just appeared because I am archiving my economix entries. Unemployment insurance and other types of social insurance subsidize job separations and thereby result in too many layoffs and too few people employed. A variety of programs help workers after they leave a job and do not start a new one, depending on the circumstances of the job separation. Unemployment insurance is often available when the worker was laid off and continues to look for work. Disability insurance is available when a worker’s health makes it too difficult to remain on the job. Social Security’s old-age insurance program provides income for elderly people after they leave their jobs. Layoffs, disability events and retirements have some differences, of course, which is why each type of job separation has a separate insurance program. But in each case, a working relationship between an employer and an employee has been terminated, and the worker has not started a new one with, say, different working conditions or a different rate of pay. In their analyses of disability and old-age insurance, economists have found that insurance reduces the cost of job separations and thereby increases their numbers, because the insurance helps replace the income and production that is lost when the worker stops working. The prospect of the insurance payments gives employers less reason to change the nature of a job to encourage a disabled or elderly employee to remain at work and gives employees less reason to accept changes in working conditions or pay that would make it easier for employers to retain them. Note that disability benefits are paid to employees, not employers. Nevertheless Professor Autor and other economists conclude that the benefits affect employer behavior because the employment relationship is exactly that: a relationship between employer and employee. If an employee has better, or less bad, options outside the relationship, then the employer will find the employee more expensive to keep. Disability and other forms of social insurance increase the income employees can receive outside the job and thereby make employees more expensive from an employer’s point of view. The economists Jonathan Gruber and David Wise have found that Social Security provisions “provide enormous incentive to leave the labor force early.” Just like disability insurance, Social Security provisions can shift some of the burden of job separations from the private sector to the public insurance programs and thereby give the private sector too little incentive to prevent or delay the separations. Employers sometimes experience reductions in demand from their customers, as auto manufacturers and home builders did early in the recent recession. One way they react is to lay off part of their work forces. But they could also adapt to less demand by work-sharing, reducing prices charged their customers (or increasing those prices less than the general rate of inflation) or reducing wages. Smart employers recognize that one of these adjustments — layoffs — brings forth help from the government through its safety-net programs (on behalf of employees); the other adjustments do not. If the safety net were less generous, there would be fewer layoffs during a recession, because employers would adjust less with layoffs and more in other ways. (State unemployment insurance programs are, and have been, “experience rated” in the sense that employers sometimes find their payroll taxes increased for each employee they dismiss. However, the experience rating is imperfect; some employers are already at the maximum tax rate and further layoffs would not increase it. More important, the effect of experience rating on employer costs of layoffs was present even before the recession. What’s new since 2008 are the federal extended and emergency unemployment programs that are not experience-rated, thereby adding to the benefits an unemployed person can expect to receive without adding to the taxes levied on his former employer). Thus, even if it were true that the unemployed completely ignored the safety net’s generosity in their decisions to seek and accept jobs, the safety net would still increase unemployment during a recession by increasing layoffs. Although it looks at incentives to avoid job separations in its consideration of disability insurance, the C.B.O. makes no mention of the same incentives in its analysis of unemployment insurance and consequently is premature in its rejection of the basic economic proposition that paying people for not working will reduce the number of people who work.